Mickie Most: producer. Mickie Most: never a moniker more perfect. This guy’s name framed a 60′s pop music producer with total accuracy. Don’t know much about him, never got to meet. Yet his records from the ’66 – ’68 period really had a stamp. And the legacy continued into the 70′s, with his label RAK. But back to the 60′s…. Not sonically unlike Donovan’s ‘Sunshine Superman’ or ‘There Is A Mountain’, The Yardbirds’ ‘Goodnight Sweet Josephine and ‘Ten Little Indians’, as well Jeff Beck’s ‘Hi Ho Silver Lining’ and ‘Tally Man’, all of them Mickie Most productions, I’m guessing his secret was a magic wand chock full of studio compression. Not being an engineer, I can’t say for sure, but indeed there are similarities whereby certain instruments get maxed out in a most appealing way. Maybe that’s where a play on the word most, or Most, gets a little too clever. Sorry. Seriously though, I do recall hearing ‘The Boat That I Row’ those first few times on my local Top 40. It was warm, springlike weather and wow, did this song jump right out of the sludge. 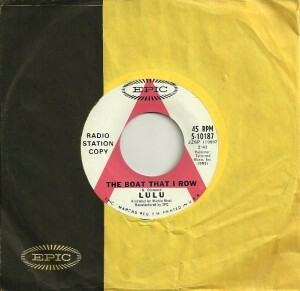 I wanted Lulu to have a US hit for seemingly ages, and now, clearly, the moment had arrived. Technically, this single reached #1 in the States, but oddly not as ‘The Boat That I Row’. Instead, the original B side, ‘To Sir With Love’ suddenly gained momentum, given the film had just successfully debuted in theaters and was on a tear. So radio stations flipped it, as it was referred to in those days, meaning they began playing the B side and shunning the A. ‘To Sir With Love’ scaled to that coveted #1 slot, but in my world, ‘The Boat That I Row’ was always the chart topper. I mean, it technically sat right there on the pointy part of the pyramid. This entry was posted on Wednesday, February 1st, 2012 at 12:01 am	and is filed under Donovan, Epic, Jeff Beck, Lulu, Mickie Most, RAK, The Yardbirds. You can follow any responses to this entry through the RSS 2.0 feed. Both comments and pings are currently closed.